PCs, the Stars of the Show! They only had this fight because of the choices they made! 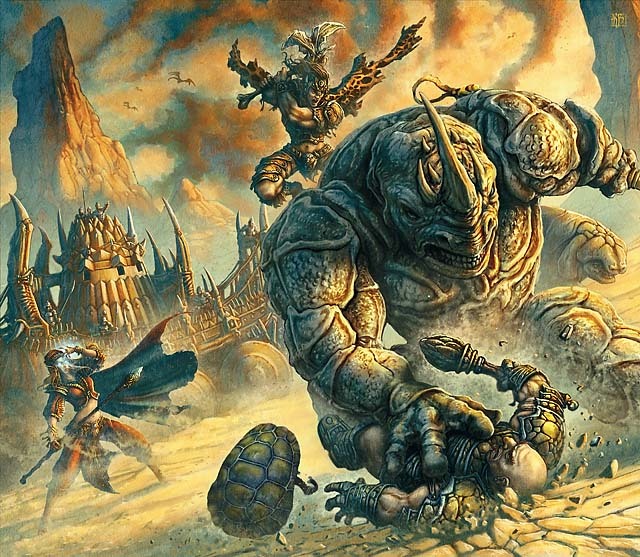 A lot of my experimentation with my Dark Sun home campaign has been around building a player-driven campaign. A player-driven campaign is one where the players often choose how the campaign will progress. The players make choices through their PCs, and this in turn drives what happens next or how events unfold. It is important to note that this isn’t a sandbox without direction. Players usually like direction – they came to be part of a story, not to flail about with whatever comes to their minds. 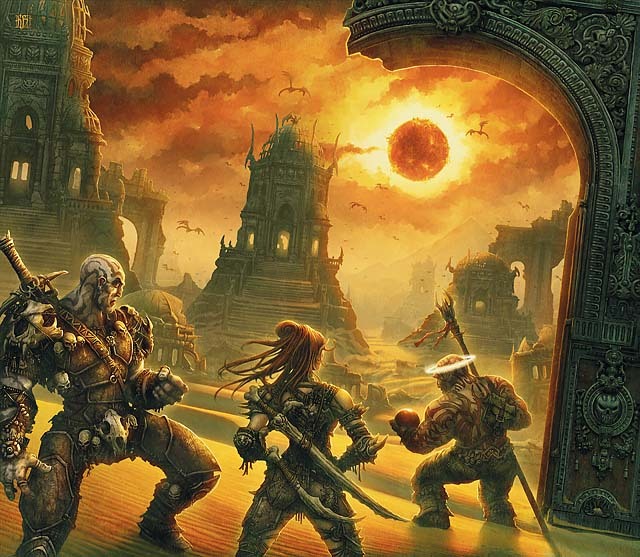 In a player-driven campaign the DM is still in control and still plans plot arcs and campaign elements, but the DM also uses a flexible approach and finds ways the story can respond to the PCs. This gives players the feeling of both participating and being important – their actions matter and have ramifications. In this article I will focus on incorporating PC backstories as an effective and relatively simple way to create a player-driven feel. This is an excellent way to bring in a limited player-driven aspect until you feel more comfortable taking additional steps. As I described earlier, I like to plan out a campaign before I begin play, using techniques like storyboarding to develop the overall story and plot arcs. One of the first things you end up doing is choosing a home base and campaign premise for the campaign. In a small village, preparations are made for a coming of age celebration. As innocence is lost the sands reveal a source of power. Power, unfortunately, is desired by many and always comes at a price. I set up an online campaign tracking site (I picked Epic Words, liking it a bit more than Obsidian Portal) and provided information via the Wiki letting them know that they were to start in the village of Burning Rock, located south and west of Dragon’s Bowl. This small village mined flint for House Inika. There is a coming of age ceremony coming up, where they will compete against another team for the right to be treated as adults and allowed to perform a sacred duty for the village. I described a few NPCs. What all of this did was to establish the setting and initial campaign tone for them. They knew this wasn’t a gladiatorial campaign, or a Veiled Alliance campaign, etc. They could think about why their PC was in this village, what they did, who they knew, etc. The players immediately began to ask questions, and by doing so, change things. Nearly every PC ended up being an outsider. Two PCs had parents that had come to the village, but the rest had come on their own during their lifetime. I immediately cast them as the outsider team, and the other as the “home team” that felt victory in the ceremony would be rightfully theirs. I encouraged players to provide NPCs. At least four major NPCs were the result of PC backstories. Chacao the psion had the drunk perhaps-father that beat him up. He became the town’s distiller. Rensade had an old wise woman that had brought him in and helped him, so the woman became the town’s wise woman that grew all the cactus crops. Their picking these NPCs changed things for me, as now different NPCs would be taking certain plot actions. The PC backstories were very influential. I had a choice of four city-states that would feature in the campaign heavily. PC backstories drove which two made the cut. Many of these changes weren’t felt that actively by the players, but they have subtle effects. They make outsider PCs, and now the village reacts that way to them as they prove themselves. They continue to win the village over as they actively decide how much to care for it. It becomes a theme for the campaign and reinforces the plot, making it stronger and more heartfelt. Turnabout is fair play. I encouraged players to be flexible and asked that their first work on backstory should come to me first as a draft. A player might want to play a dragonborn (a dray on Athas), but know little about the race within the setting. They may want to pursue the merchant theme and have an idea for making that happen. As I review the campaign story arcs, I might suggest for the PC a different merchant house, based on the ones that will be involved in the campaign. I might take their idea as to how they came to the village and suggest a change based on dray history (and provide them with the basic information they should know), and pick a link to an Athasian organization. In all cases we have to both agree. The result is much richer for both of us. You are encouraged to first pick your race, class, and theme as a role-playing concept. These three aspects will have a very profound impact on the way the setting reacts to the PC. If you like a particular combination but do not like the mechanical options, we can work together to improve the balance of those options (for example, creating alternate theme powers). The idea is to really have a concept of what you would enjoy playing at that high story level instead of getting into the mechanical level (I want to be a dwarf ranger merchant… rather than focusing on how a hammer and certain feats would dish out a lot of damage). The later is cool, but having the RP stand on its own first can make a stronger campaign. As I mentioned in the previous post, we use an e-mail list (Google or Yahoo groups work fine) to discuss the campaign. Players worked as a group to discuss their PC builds. What was really cool is that one of them came up with the idea of each player choosing one other player and creating an RP link to that PC. The chosen PC did not choose them back, but rather chose a different PC. The result was a cool tapestry of connections between them. They started not only with a knowledge of what they were (half-giant warlock cursed by his city-state), but an actual connection (my PC took the half-giant under their wing when he came to the village). It was really cool to have the PCs come to the first gaming session with a lot of depth and RP already underway. I maintain a file that has each PC’s name, class, race, theme, and backstory summary. I note any links to PCs and NPCs. I note any connections to the plot. I note any ideas for future involvement. For example, the halfling said his parents came to the Tablelands under mysterious circumstances, with the father going missing. I immediately jotted down ideas for the fate of the father. A few play sessions in I have dropped a hint as to where the father might be. I also make special note of any PC goals or mysteries that can be explored and furthered by the campaign. A PC with a mysterious curse just begs for that topic to be explored and revealed slowly over time. I try to plan for how to bring in PC backstory for two gaming sessions at a time. Often this is just a small hint, but it grows into something over a few gaming sessions. Even a small link to a PC’s backstory can feel significant and a major one (such as an NPC from their past) can be a lot of fun for the player. For each PC I try to have a major plot point that will come out at some point involving their backstory. By spreading this out over the campaign, everyone will have a turn in the spotlight. These techniques create a cool feedback loop between the campaign you have planned and the PCs that will star in the campaign. By opening dialogue with the players (and between players) the campaign begins to be influenced by them and they by your ideas. All of this becomes a cornerstone for a player-influenced or player-driven campaign. This entry was posted on October 7, 2015 by Alphastream and tagged Backstory, Character Building, Crown of Sorrow.